Warning – Long post with many pictures – Grab a Cuppa and a snack and enjoy! 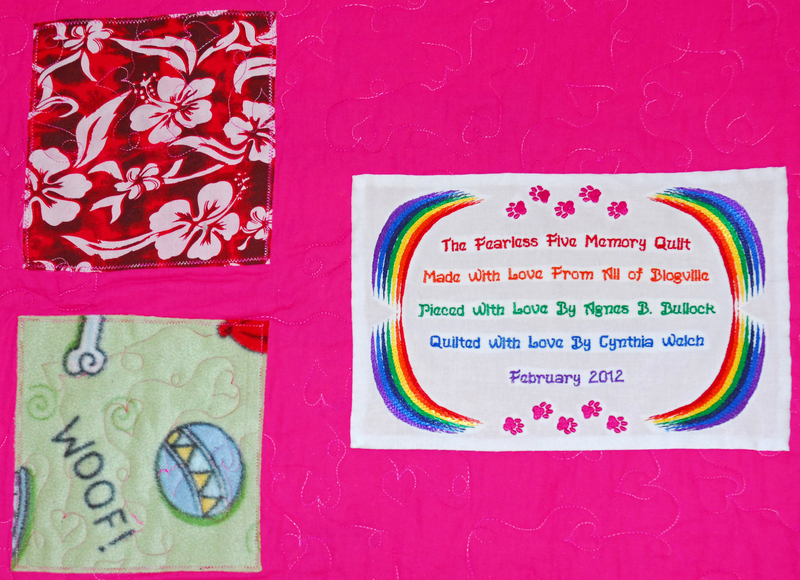 As many of you may know Sandra and her family have received the Fearless Five Memory quilt so now I can reveal my part in this project. 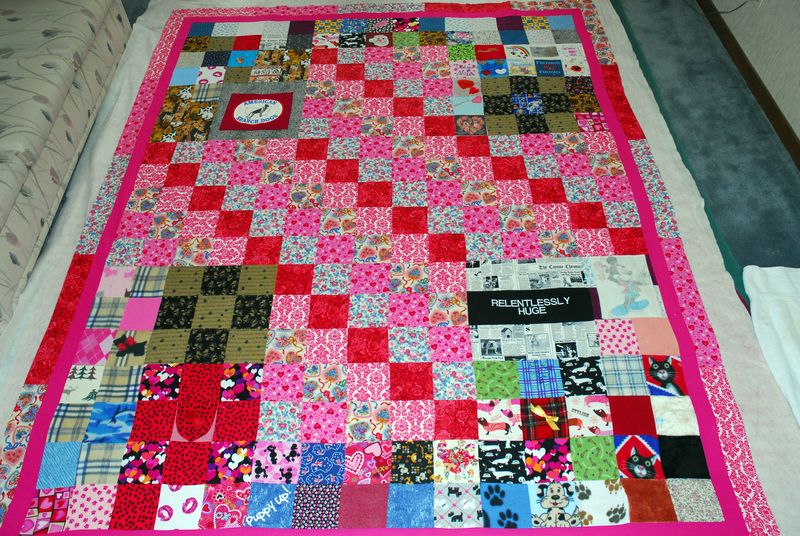 When I received the quilt top from Agnes (What’s Her Name from Dachsies With Moxie) I thought it would be better for the quilt to add some borders around the outside edges. After getting approval for that from Agnes I proceeded to add that to the quilt top. The size of the quilt top was now about 115″ x 93″! The next step was to cut the backing fabric and batting (the middle layer of a quilt) to the correct size and then baste all three layers together. I like to spray baste my quilts together which means I use a spray adhesive on each layer to allow them to stick together. The process involves laying the backing fabric on the floor and pinning it to the rug to keep it stretched out. Lucky for me our living room was just big enough for the quilt to fit. The next thing you do is start to apply the spray baste and stick the batting to the backing. This requires much crawling around on my hands and knees to smooth the batting as you go. Then you repeat the process to add the quilt top to the sandwich. I regret to inform you that there were no pictures taken during this process so you will just have to use your imagination regarding me crawling around on the floor. And for those of you who were wondering where Nina was through all of this we put up barricades to keep her out of the room. I don’t think I want her getting sticky paws by walking over the quilt as I was working. Then it was time to start quilting. I decided to use a variegated pink thread on the top and bottom and had purchased a 2000 yard spool. 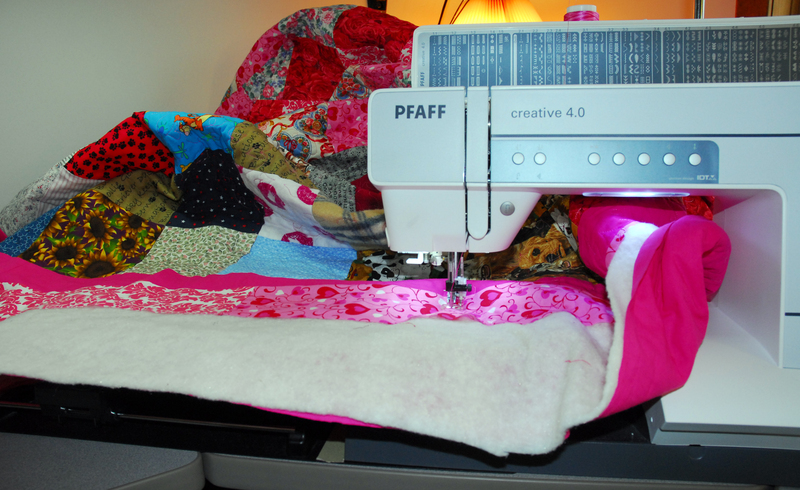 When I quilt I use a device called a Fab-U-Motion that includes a stitch regulator. I hope some of you haven’t stopped reading yet as I don’t want to bore you with the details, but I think some of my readers might be interested so bear with me. In case you are wondering, a stitch regulator helps you to keep your stitches even while you are quilting. 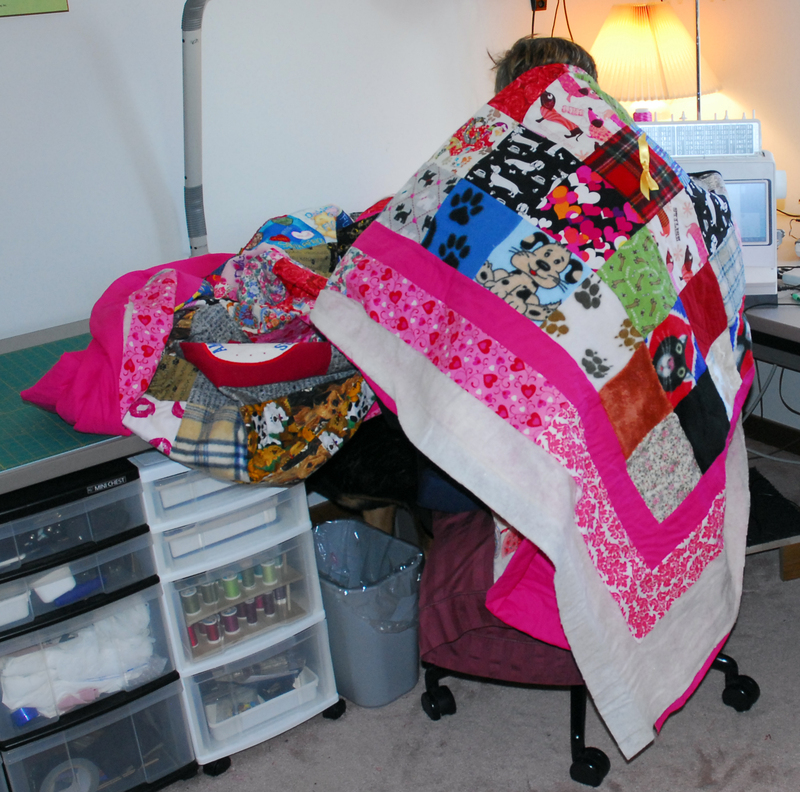 With such a large quilt there is a lot of wrangling involved. 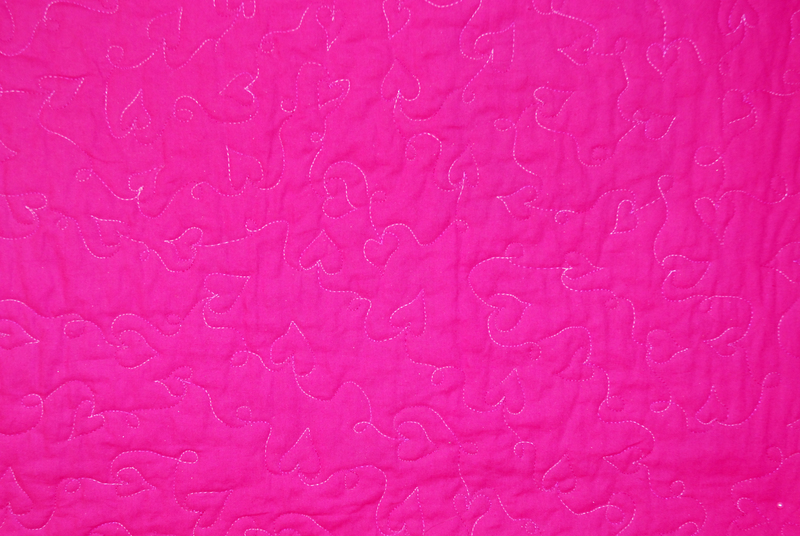 If you don’t know anything about quilting I will try to explain. When you are working on the middle of the quilt you have to squeeze half of the quilt into the area to the right of the needle. To do this you have to bunch it all up and still have room to quilt. This gets a little easier as you work you way out to the edges. The other thing you have to do is support the quilt so there isn’t too much weight on the needle as you move the fabric under it. It is not a pretty sight and sometimes you have to wrap it around yourself to accomplish it. Not trying to keep warm. Just wrestling with the quilt. 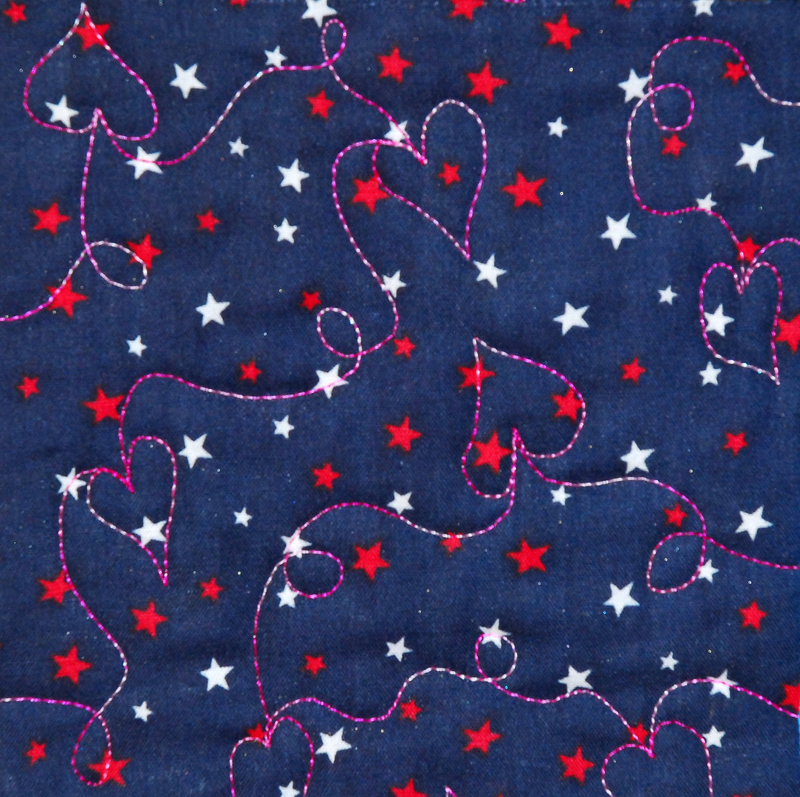 The motif I used over all of the quilt is what I call hearts and loops. It is just as it sounds and meanders all over the quilt. Here is a video of the quilting action. I lost track of how many hours it took to complete after the third day of 4 – 6 hours of quilting, but it was not a chore at all. 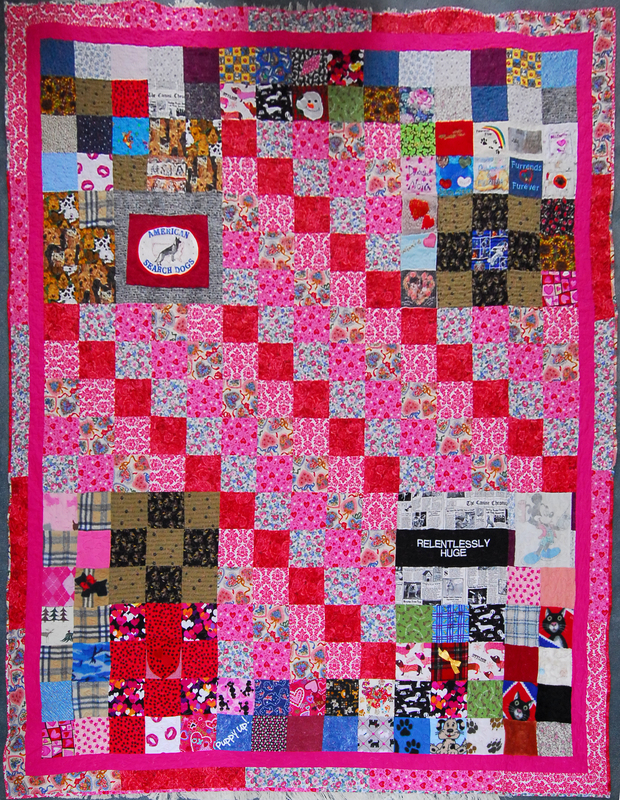 This was such a labor of love for all of us involved and while I was quilting I was thinking of all the bloggers that contributed fabric for the quilt. When I am quilting along it is almost like having a “runner’s high” and I don’t pay attention to what is going on around me. It’s a good thing I had a 2000 yard spool of thread to start as I almost used every inch of it. In the above picture the spool on the right is a full spool I am using on my next quilt, and you can see there isn’t much left of the pink. After I finished all of the quilting I had to trim the edges to make them straight and then attach the binding. The final finishing touch was to add the label to the back. I am very honored to have been able to be a part of this wonderful project and I just know it will bring Sandra and her family years of comfort and love from all of Blogville. Once again…Blogville Rocks! And I can see my square!! God Bless you for all that you have done! Just beautiful! I can see my squares too! Thank you for all your hard work! I am totally speechless. This quilt and all the work that was put into it is just amazing. You guys are real angels for doing this. That is so beautiful! 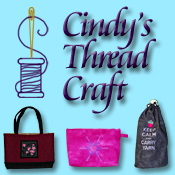 And I totally support choosing the PINK quilting thread! I would have, too. Woo. How come Nina didn’t get to help smooth the quilt out? I’m always REALLY helpful with that part and get a lot of “thank you, Dave”s. ??? Maybe next time, Nina! That’s interesting about the stitch regulator for the Pfaff! 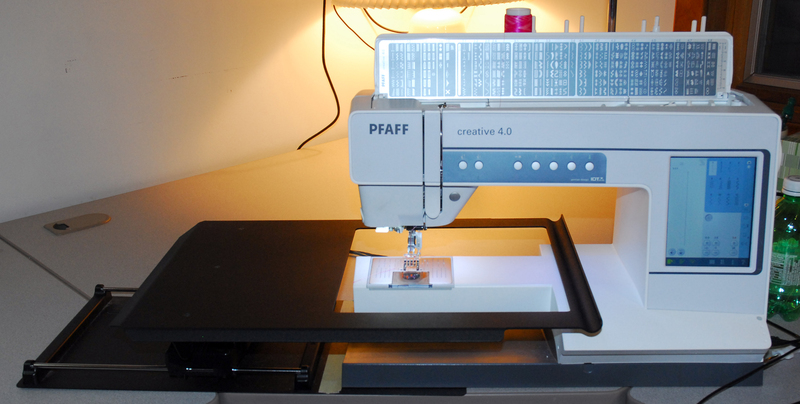 We enjoyed the video; Mom’s first machine was/is a Pfaff and she is quite partial to them. When you bunch up the quilt to do the middle, do you say lots of HBO words, or is that just my mom? Ha woo. Just kidding. Sort of. To answer your question about working on the middle of the quilt, yes there are sometimes HBO words that come out of my mouth. They become less frequent the further out I get. I loved this post. OH the QUILT is just so FILLED with LOVE!!! I can’t think of anythinyg more to say. It just took my breath away. Ohmydogness!!! It turned out even more beautiful than I imagined!!! The heart quilting pattern you used was just perfect. What a wonderful job you did! This is great! Bless you for all you have done…. That is amazing and Mom’s eyes are huge right now as she is looking at that beautiful quilt. You are wonderful and God bless you. WE HAD KNOW IDEA WHAT WAS INVOLVED IN MAKING A QUILT. THE SQUARES AND COLORS ARE JUST PURRFECT TOGETHER TOO. Hugs and many THANKS for all your hard work. Making a quilt is a lot of work and thankfully I only did half of this one. Agnes from Dachsies With Moxie pieced all the blocks together and did an amazing job coordinating all the colors from all the blocks that came in. I don’t think I could have done it as well. Okays, me and mum be sittin; heres withs tears in ours…dis be da most gawjuss thing I evers did see. OMD, da time and energies and all dat! WOW! Everything just looks so perfect down to da heart motif…which was a brilliant idea. Thank you so much furs all your time and hard work and dedication to helps complete dis most beautiful quilt. You did a beautious job on this quilt! I did not get a piece of fabric sent in as I wanted to,,,, which I am sorry about. But I know this quilt has so much love in it from all who took part by sending in their square- all the love will help heal. Love is a bridge into the heart.